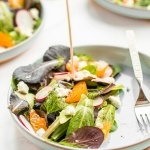 With all the heavy dishes that accompany cold weather and seasonal holiday meals, I think we can all get behind a light salad every now and again. 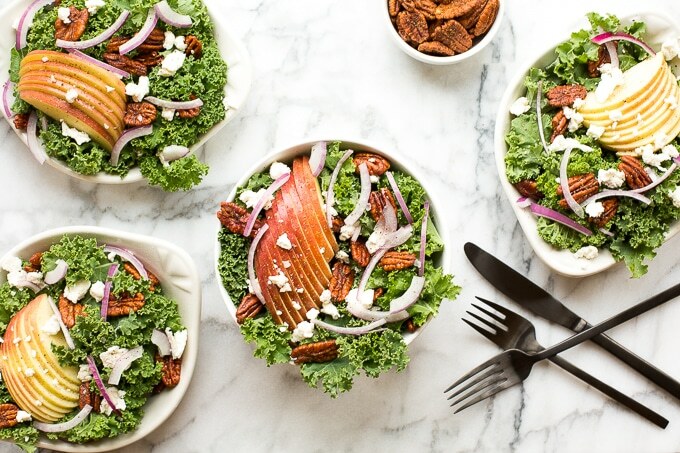 Winter kale salad with apples, goat cheese and spiced pecans tossed in apple cider vinaigrette can be on your table from start to finish in 10 minutes. Take that, lazy weekend dinner! AND this recipe is versatile. 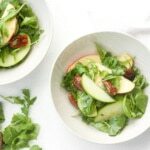 Basically, you can think of this recipe as a guideline: 1 bunch of your favourite leafy green + 1 crisp fruit + your favourite cheese + crunchy nuts. Leafy green: You can use whichever type of kale you like best. I usually go for Lacinto kale (also known as Tuscan kale), but this week, I could only get my hands on curly kale. What if you are not a fan of kale? 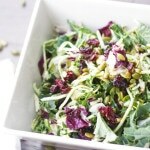 Easily switch it out for your favourite leafy green. I would recommend swiss chard, collard greens, and mustard greens, which work better in this recipe than spinach or arugula. Crisp fruit: You can substitute the apple with pear. 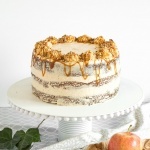 Cheese: I grabbed tangy and sweet goat cheese to balance the flavor of the spicy pecans. For an alternative, try blue cheese. Crunchy nuts: You could also use regular toasted pecans and call it a day! 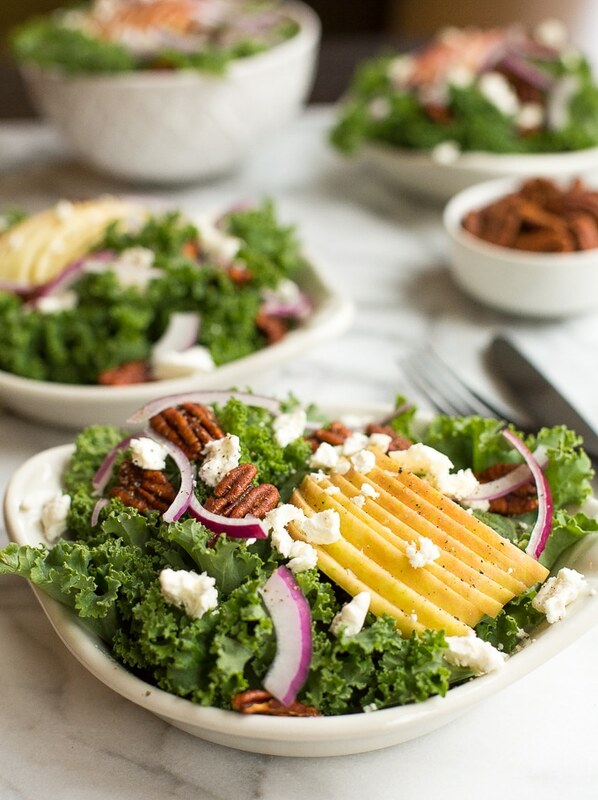 You can also add some protein to this winter kale salad. Store-bought rotisserie chicken (my go-to on a long day when I don’t have time to cook multiple elements in a meal) is the perfect accompaniment! So, so good. Can we also take a minute to talk about the most appropriate seasonal dressing ever?! 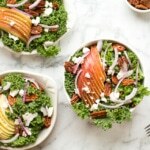 Apple cider vinaigrette is what all your salads need from now until spring. Double the recipe and save half in the fridge for the following week! Have you tried spiced pecans before? They add a really delicious zing to salads, cheese trays, and are even perfect for snacking on solo. I will definitely be leaving a bowl of these out for my guests before our holiday meal. Can’t get your hands on spiced pecans at your local grocery store? No problem! Just make your own with a handful of ingredients and a few simple steps. Lightly toast pecans in a non-stick skillet. In a small bowl, combine 1/2 teaspoon ground black pepper, 1/2 teaspoon cinnamon, 1/2 teaspoon brown sugar, 1/2 teaspoon cayenne, and 1 teaspoon of salt. In a medium bowl, add pecans and 2 tablespoons of butter in a medium bowl. Toss to coat. Add spice mixture and toss again until fully coated. 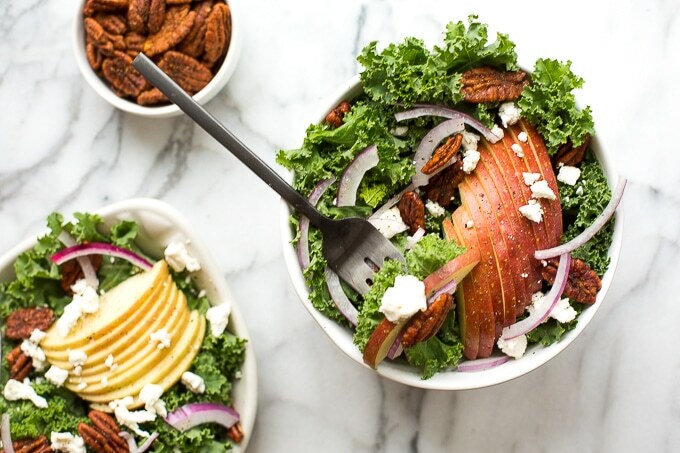 Cozy winter kale salad with apple cider vinaigrette is easy to make with crispy apples, tangy goat cheese and crunchy spiced pecans in under 10 minutes! 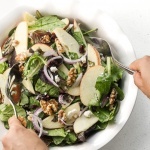 In a small bowl, make the apple cider vinaigrette by whisking together vinegar, mustard, salt and pepper. Slowly drizzle in olive oil and whisk to combine. 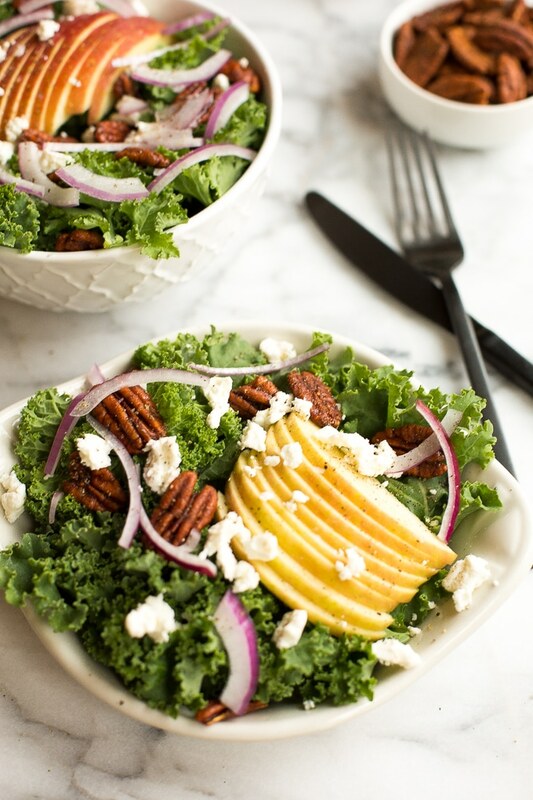 Place kale in a large bowl and pour dressing over top. Toss to combine. Let sit for 10 minutes. Add apples, goat cheese, and spiced pecans. Season with additional salt and pepper to taste. If you can’t find spiced pecans, you can use plain toasted pecans (or whichever type of nut you have on hand) or make your own. See above in blog post for instructions! Cans you use another type of cheese?? Yup! Use any cheese you like! 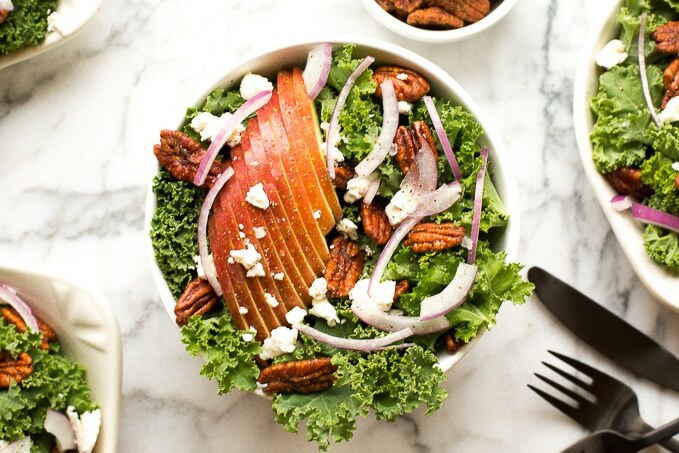 This is such a gorgeous salad that is perfect for fall. I love the idea of making it an appetizer for Thanksgiving. Can’t wait to try it! looks so fresh and yummy! and your photos are so clean and beautiful.